2 days before Christmas, heading back to Singapore after a great time reuniting with family and friends in Malaysia! Travel safe everyone during this coming week of holidays! 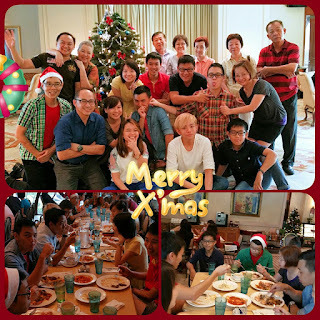 It is just past midnite now in Singapore and we take this opportunity to wish all those celebrating Christmas to have a blessed time with family and friends. 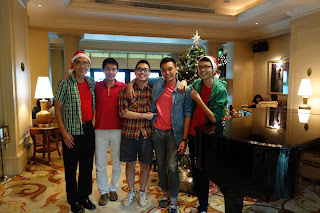 The above is how I use blogger for my lengthier journals with the quicker facebook posts that are also timelier too to include them later by embedding them into this blogpost to create a smooth flowing account of events this Christmas season. For more of my thoughts that flow to me on this Christmas season as well as more events towards 1st Jan 2016 whether posted on facebook or not but is important to record it in my personal journal here, they will be posted later to be found below. This photo is from Simon's facebook timeline shared with all. Thanks to Claudia hosting the big gathering at the Raffles Town Club where the the great buffet fed us all throughout the afternoon...ho ho ho! 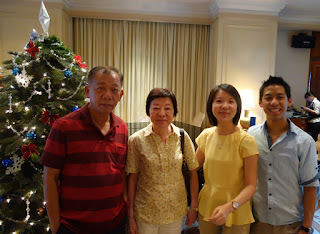 Here is our extended family group photo from my camera. We missed Mom in it but I knew she was smiling to see her grand niece Beverly present whom I gave a 'high-five' to on her behalf when I saw her joining us late on the dining table earlier! This photo was cropped to become my cover photo in facebook. Here we're happy to see Justin joining us from the US. It is not often that all the boys can get together on a holiday to play together in a sync internet game and so that is how they spent the night. 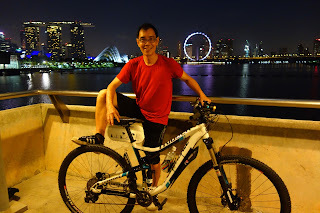 ...formed the 3 Musketeers to patrol the streets of Singapore on pedals! ...with the moon peering out of some clouds in the night sky. The scene in the 'Gardens in the Bay' gave a feeling of a white Christmas in Singapore featuring an 'Ice Palace' on the grounds that charged an entrance fee of SGD12 per person to see snow inside. Unfortunately it was closed at the time we were there past midnight. One of the 3 Musketeers, Matthias, seem to have some special spirit of Christmas that emanates light in himself as well as causing the buildings in the back ground to have a glowing effect, even shooting out laser rays to the sky! Expand this night photo to appreciate it. 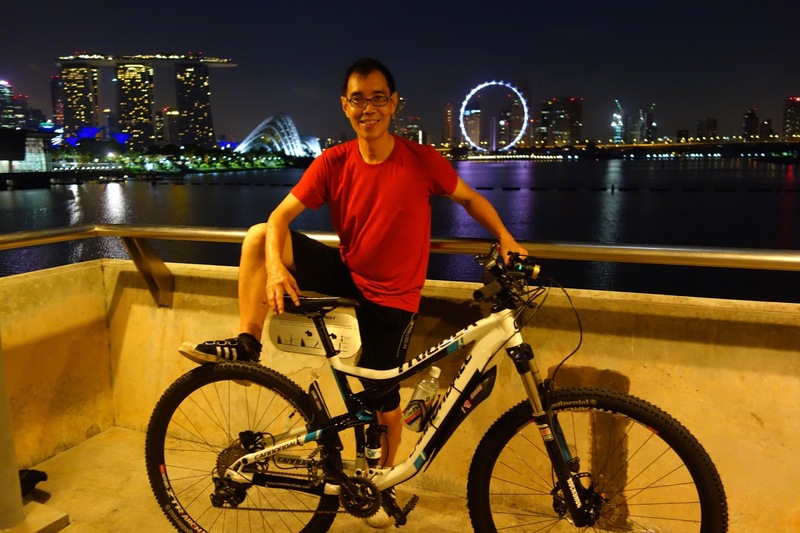 Lim from KL also is a worthy member of the trio who rides pretty fast on his horse... bike I meant! Dad the KL City Kid or Boynie(his real childhood name) was the camera man of the night. He had to make his own 'selfies' or in terms of the old fashioned days, use the self timer of the camera especially when all the 3 musketeers want a group pic together like the one shared above. Musketeers burn up a lot of energy especially when on their pedals so eating local food like Singapore 'Hokkien Noodles and Satay' at 'Lau Par Sar' or the old market in the financial district was was a necessary activity! Dinner and Entertainment in a get together of representatives of 5 families from Malaysia, Singapore and the USA. 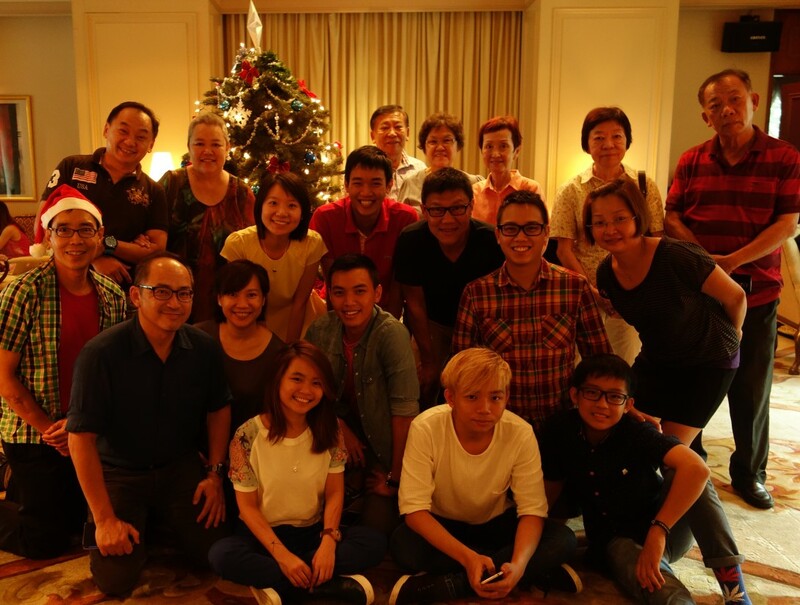 Looking back at our family photo of 2006 above reminds me that our family in Singapore is missing 3 women in our year end family activities. 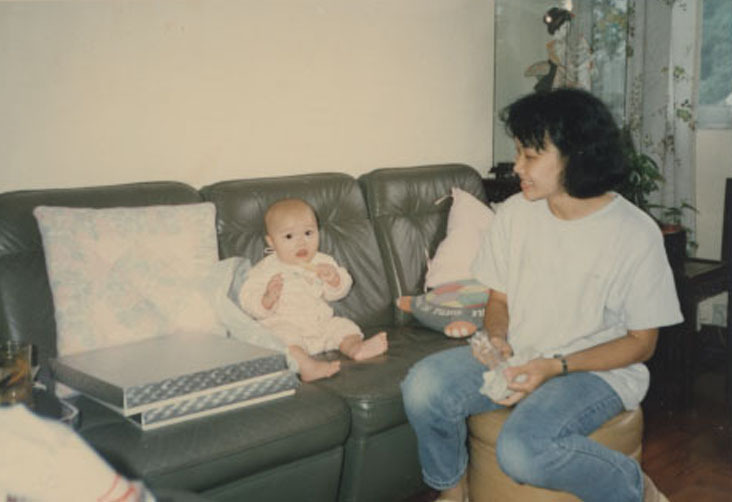 One of course is the mother of our family, Geok Lee who is in heaven, and then the two girls in the US with their own startup families. Fei Min the oldest is in the West in LA while the younger Su Min is in the East in Boston who is expecting our first grand daughter this coming late Jan or early Feb! 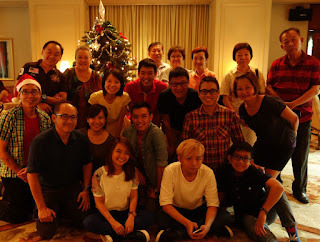 It was great when the girls could come over with their spouses to have our big familylane reunion in Singapore as they did in 2014 when the above photo was taken. Looking forward, I can imagine our nuclear family photo shot becoming more crowded as more begin to marry and bring along more kids of their own to our family reunion some day in the future. We can dream all kinds of things of the future like I did as a young boy nicked-named Boynie by my parents and called by all my siblings with it to this date. They are all older than me and never did they expect that this Boynie would have more kids than any of them! Neither did they expect a Didi to come by too! Predicting the future definitely isn't as accurate as recording something of the past so I will not dwell too much into the future but pray often for the well being of my family and also of my friends as my memory of them is somehow well entrenched in my Heart and Mind! My favorite saying goes as follows, "Live as if everything depends on You, Pray as if everything depends on God." When I say entrenched, I mean they or my good memories of them are like attached to me with super glue. Let me give an example of something that happened recently that coincidentally led me to connect to an old friend that I had lost contact with for about 13 years. His name is Bill Shuetz a young man that came to Kuala Lumpur in the 90s as a lecturer in IT for a local college. Now he had returned to the US after his tenure was over and without the internet then, we used the snail mails to stay in contact. I will add photos to our story to make it more real as I have always done with my personal journals to this date. In Nov 1998, I had a trip to Los Angeles and we had arranged to meet. 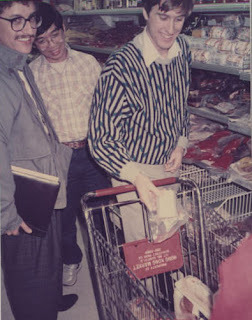 Now Bill is a vegetarian and I recommended him a Taiwanese supermarket that sold all the vegetarian meat looking and tasting products that were all made from soy bean. I remember that Bill was so elated and some of us in our group who followed him were amazed how he filled a whole shopping cart with them! 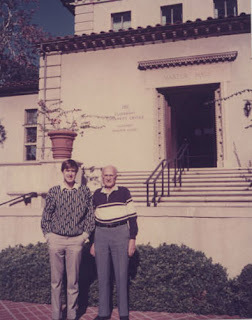 I had also introduced Bill to my former Mission President, Talmage Jones who came from the Redlands to visit me in LA. 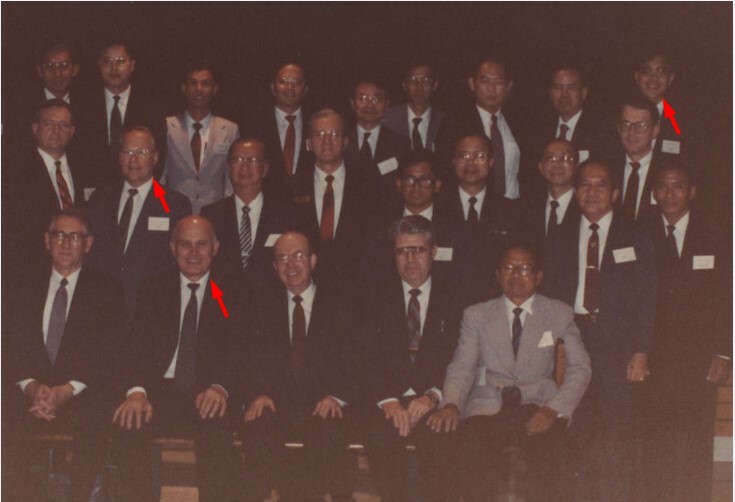 Bill also got to meet an old friend and business associate of mine Tony Seow from Utah who was running a business in LA at that time. It turned out to be a nice little reunion for me in LA with old friends from the US. An interesting event that Bill invited me to attend was a lunch lecture/talk in his university by a speaker with expertise in International politics or relations. Right after the talk, Bill introduced the speaker to me and when he heard I was from Malaysia, this lecturer remarked something to this effect, "Malaysia? Why I actually wrote a book about Malaysia and cited it as a model country with good multi-racial relations with its people!" Then he added regretfully, "Unfortunately, I published my book in 1967" I immediately understood why it was regrettable. Well he couldn't predict the future either that records Malaysia had a racial riot in 13 May 1969 when the opposition party had a major victory to celebrate in the streets but were attacked by supporters of the major ruling party who lost. I was just 10 years old then to only remember a curfew was imposed to restore peace in the country which had no repeated incident since then but the timing was unfortunate for the writer! 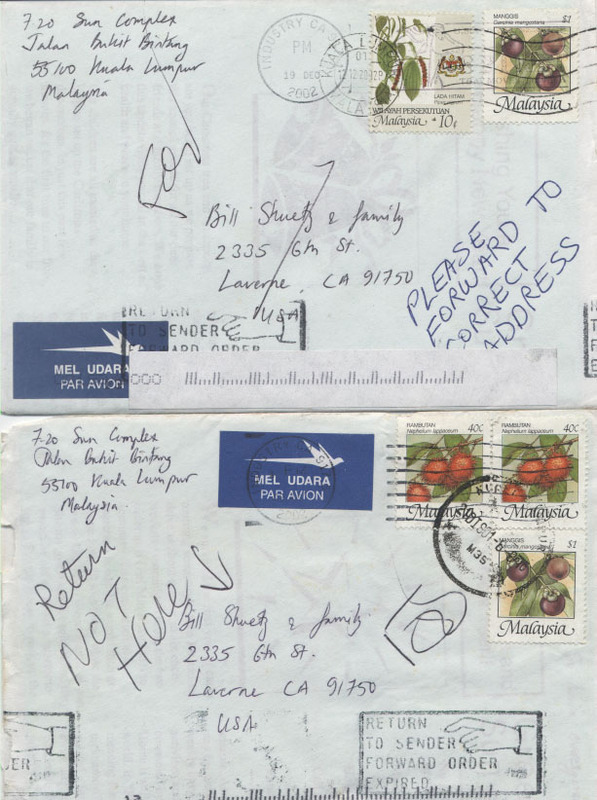 After the post mark date of December 2002 in the mails that were returned to me, I didn't know how to stay in touch with Bill anymore with my regular snail mails that were sent out to all my family members and friends yearly, before email became common, as shared in this post here. 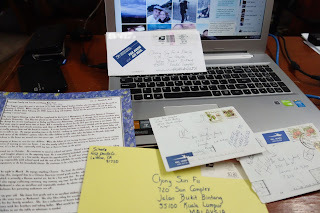 Then a weird thing happened just before I left for a spiritual China trip in November last month and I was sitting on my desk in Kuala Lumpur clearing out piles of paper, letters etc to find an envelope that was sent early in the year which I had misplaced and never opened it! Oh! It's 10 minutes to mid-night here in Singapore where the countdown will begin soon to start our New Year. Without a need to send snail mails nor even emails today, I'm sending a photo link to Facebook, containing our history of experiences recorded in 2015, just minutes to the ushering of 1 Jan 2016! The postmark of the envelope was dated in Feb 2015 and inside was a wedding card. Now the family name Shuetz sounded familiar but I checked every document in the envelope but there was no first name given of the father of the groom! 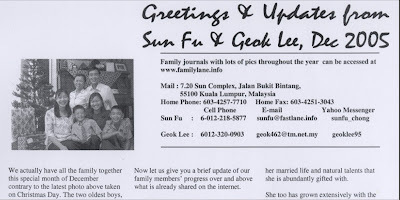 I pulled out the old correspondence file to find previous family newsletters from him and the last was in Feb 2001 where Daniel could be his son old enough to be married in March 2015 as in their newsletter, it was printed that he was 10 in the year 2000. I decided to check with a returned mission missionary from my facebook group named Emilie Wong who was from Irvine too to check if she knew Daniel's parents. She was not online and before she could respond, I found Bill was in facebook too as a mutual friend of his father. I added Bill and he accepted me in facebook so that we could make a video call to begin our connection again! Such is life in the social media world. It beats snail mails and emails providing the connectivity that I seek with my friends and family members through time and places when I can't physically be there to spend time together! We met after 45 years of separation and got together again only because of Facebook! 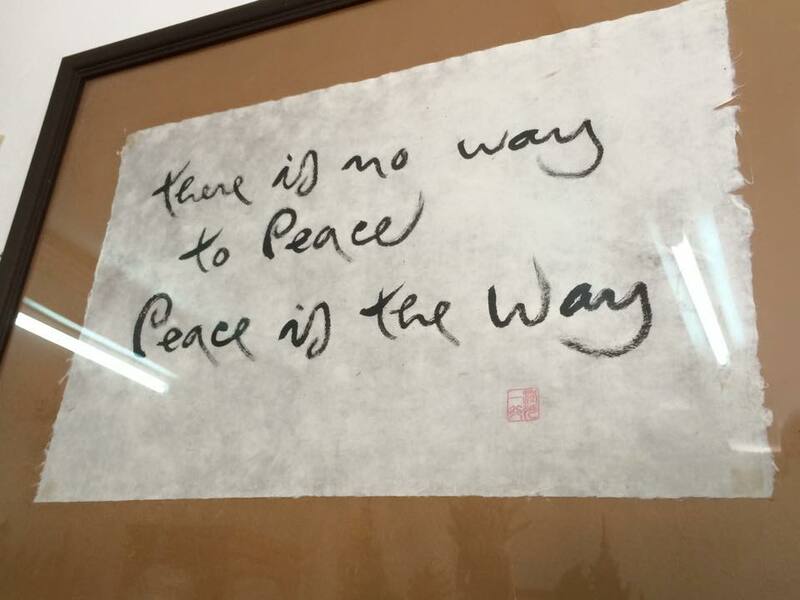 I met him in Seattle in a recent business trip to the US where he was introduced to a prospective business partner of mine who I discovered as intelligent as he was like many non-Asian Americans, would not understand the above writings that Thomas captured in this photo at the Doi Suthep temple in Chiang Mai Thailand. 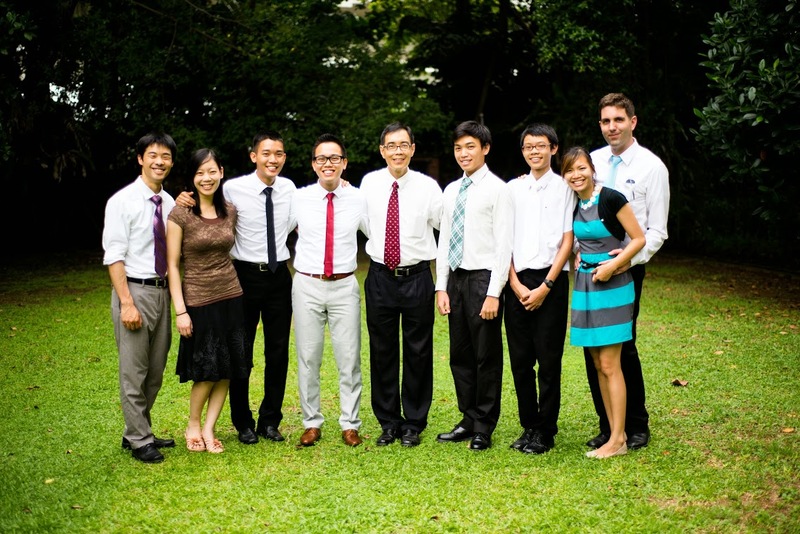 The reader can click on Thomas Poh's name above which has a link to our reunion meeting. Hope to catch up with some of you personally sometime in my next travelogue visit of the future, which is very unpredictable as I have mentioned earlier! So far I have Travelogue1 and Travelogue2 for the past which I cherish. Until then, all the best to you and yours! This is a new map that is being updated which will have cities I have visited different from My Travelogue 1 map which only had countries as seen here. 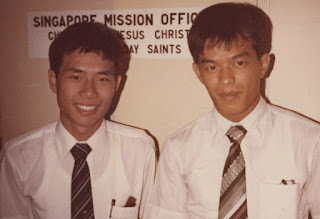 In 1981 two missionaries from Hong Kong were sent to Malaysia to take turns to be missionary companions to me and my only other Malaysian missionary companion David Soon. This is so that from one only pair of Elders working full time on a volunteer basis, we can become 2 pairs. They were Elder Yung Yik Kwong on the left and Wu Yuk Choi on the right. 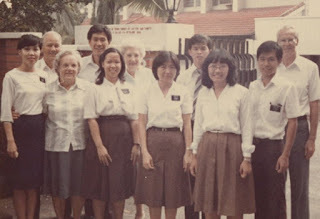 They were my first church friends from Hong Kong that I ever had whom I had taken turns to be a missionary companion to each of them till the end of my mission in mid of 1982. 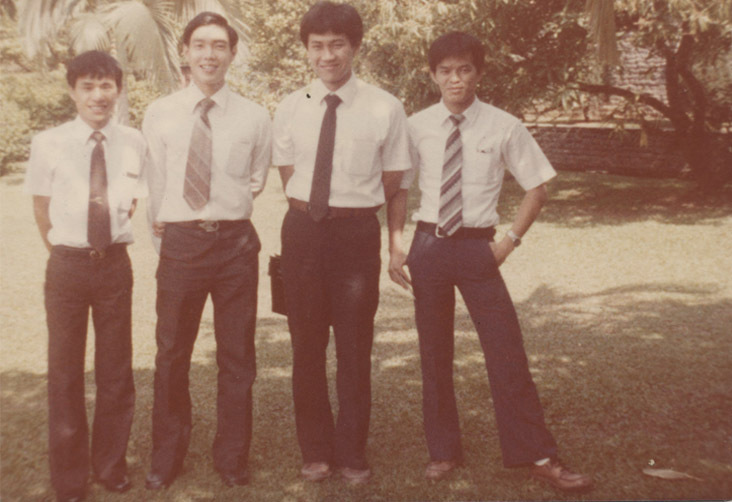 Here are the four of us from left to right, Elder Wu, Elder Chong, Elder Soon and Elder Wu. 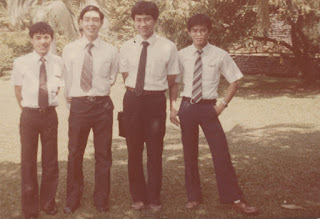 We were the four Elders serving full time in Malaysia starting from approximately the middle part of 1981. 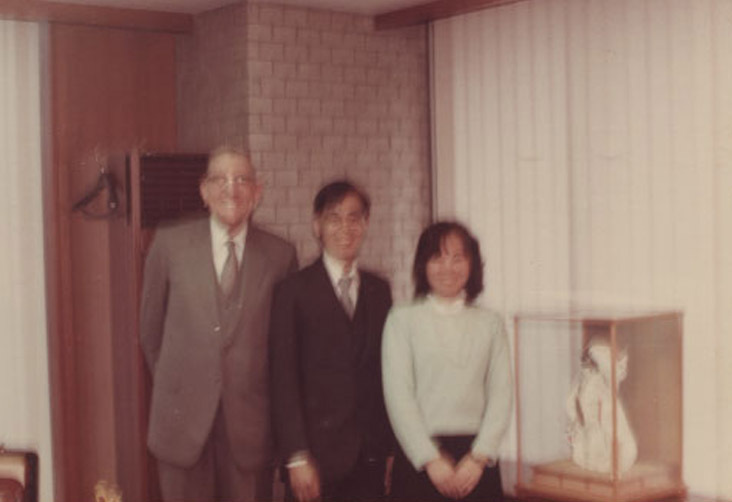 Our senior missionary companion Elder LeCheminant who trained us younger missionaries in the field. By November 1981, we had a local Malaysian sister missionary Ho Siew Yin (left of photo) called to serve with another sister missionary called from Hong Kong named Emime Woo (right of the photo) seen in the pic taken when the then Apostle Elder Howard W. Hunter visited our mission office in Singapore. Elder Hunter was a close friend of our Mission President J.Talmage Jones who was a counselor to him when he was the 1st President of the Church Pasadena Stake in the US. 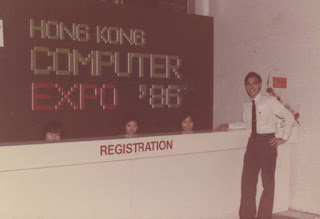 It was the IT computer business that brought me to Hong Kong for the first time in April 1986 but without emails those days or internet social media connection as today, I was not able to meet up with my former missionary companions. In Nov 1987 in another trip to Hong Kong, I managed to meet up with Emime Woo and from there kept in touch with her in Hong Kong to be able to eventually get in touch with Wu Yuk Choi in later years. Now the reader may know why my travelogues do really pass through Time, Places and People! Church Area Training in Hong Kong for leaders with names as follows from right to left arrow, firstly myself as District President of Malaysia, next Elder Dallin H. Oaks as an Apostle and last but not least Robert Houghton as President of Singapore Mission. 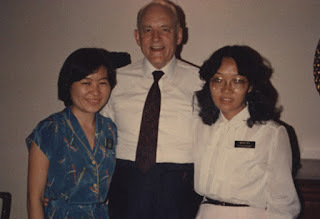 In 1993 my wife and I were in Hong Kong but didn't have the contact with any of my male mission companions yet. On that trip to Hong Kong, we crossed the border to visit Shenzhen in mainland China. Around Oct 2005, returning home from a trip to US, I dropped by in Hong Kong to reunite with Wu Yuk Choi for the first time! I met his wife on the far left of the photo who prepared dinner for me in their home. In May 2012, my wife and I accompanied our oldest son Han to Hong Kong for a temple visit as described in more detailed below to meet with Wu Yuk Choi again. 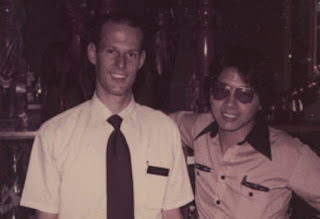 In Sep 2015, I was in Penang for a reunion with former mission companions seen in the earlier photos above, from left to right Elder Soon and Elder LeCheminant. In Nov 2015 I was in Hong Kong again as Wu Yuk Choi was retiring from his work with the Marine Police and was free to accompany me to find my ancestral village in Meizhou China. 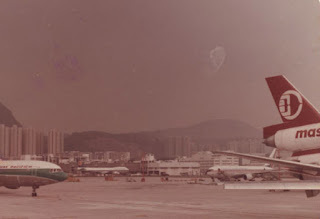 Those were the days when landing in old Kai Tak airport in Hong Kong was like a daredevil's challenge for the pilot to fly very close and low above the high rise flats to touch down on the airport runway that was by the sea and ends just before the sea too. I recall vividly the passengers giving a loud applause to the pilot after a safe landing! You can watch a video about this unique landing explained by a pilot. They had the old double decker buses familiar in London that I've sat in previously too. The difference is that in London they don't have commercial advertisement boards that stretch out like what you see in the above pic. Oxford Street in London would surely be not the same with those signboards present! Besides business, wherever I am in the world, I would love to visit with friends from the Church or other affiliations. Here is a blur pic of Elder Jacob de Jager, a Church leader who has an Indonesian wife and has done work in Indonesia. The photo was taken around April 1986. 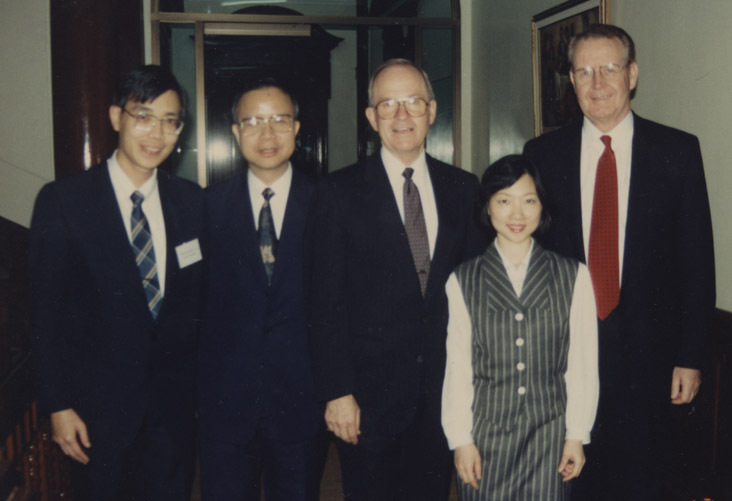 Years later in Nov 1993, I was in Hong Kong again sent by the Church for Area training as part of my voluntary assignments in serving the Church during my life time. 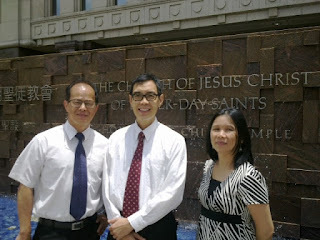 The above photo can be found in the online journal post of my service years in Church found here. When our oldest son chose to serve on a voluntary mission for the Church, he too had a chance to visit Hong Kong for his personal ordinances in the Hong Kong China temple of the Church. That was in May 2012. 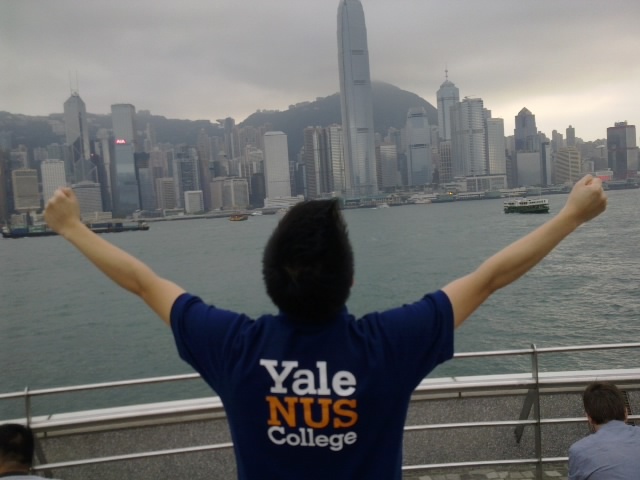 As a first time visitor to the island, I took him to see for himself the impressive Victoria Harbour city skyline. Bringing him downtown, he could see an efficient public transportation system in a modern city with new double decker buses and trams too! However, some things don't change like the stretched out advertising signs on the narrow streets of the busy shopping districts. He was brought up to the Peak for a birds-eye view of the city skyline facing Victoria harbor. 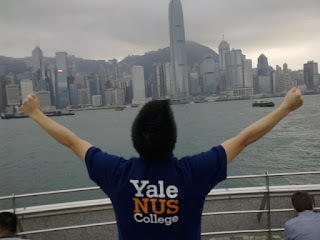 More pics and stories of his trip to Hong Kong is found here. 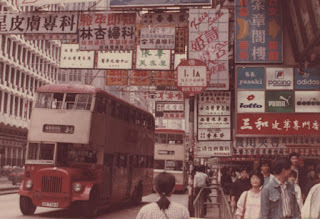 This travelogue 2 post will have more scenic pics of Hong Kong and China compared to an earlier post focused on following the trail of my ancestors and the stories behind it. My travelogues always cover a journey that passes through Time, Places and People as already seen in the introductory photos of the past shared above. Since 1998, the new airport has been operationally known as the Hong Kong International Airport or colloquially known as Chek Lap Kok Airport (赤鱲角機場), to distinguish it from its predecessor, the closed Kai Tak Airport. 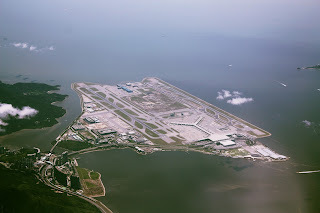 From the aerial view, one can see that the airplanes landing will be a simple straight course without worrying about any high rise buildings to be close to them as in the old airport! 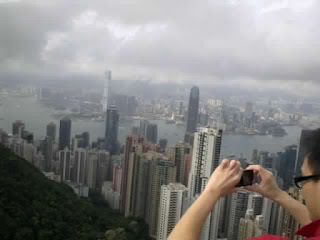 To me it also means the landing is a boring one with no unique view of Hong Kong city on landing! This is the old village that turned modern where I'm staying, Yuk Choi's empty home that he let me used for my stay in Hong Kong before he leaves his government apartment to move back to his home due to retirement! He set up fast wifi for me knowing I would need it to continue my research and writing, my friend is such a Good Man! 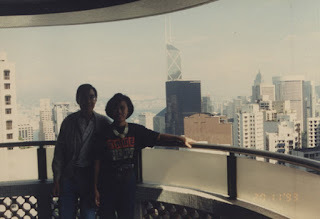 He took me to a far away place first by the MTR system where we started from 'Kam Sheung Road' station up in the north west of the train system to head south and eastwards on the purple line till the end at Hung Hom station. 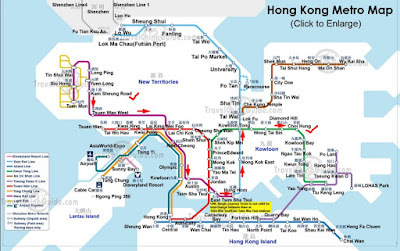 From there we changed train to the blue line to head up north to 'Kowloon Tong' station to change to the green line eastwards to get off at the 'Choi Hung' station. 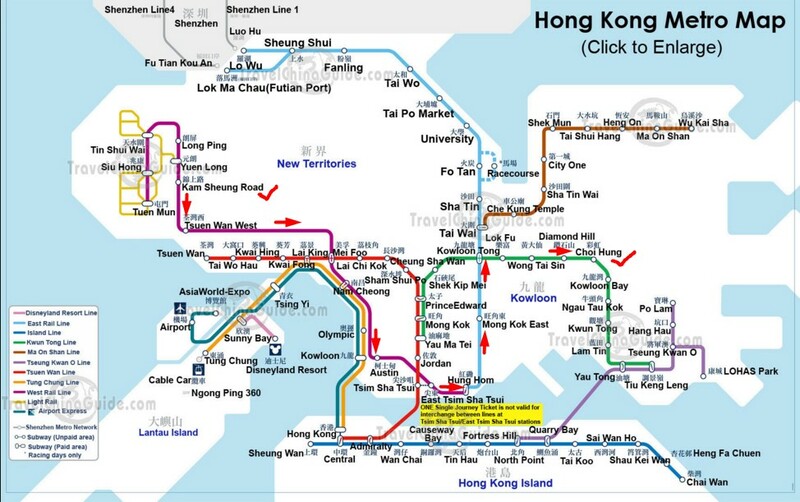 The path we took is clearly shown with the red arrows on the HK Metro Map above. From the 'Choi Hung' MTR station, we caught a mini bus no. 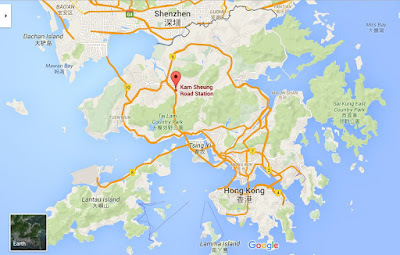 1 for a ride all the way to Sai Kung by the coastline as indicated clearly following the blue path in the map above. 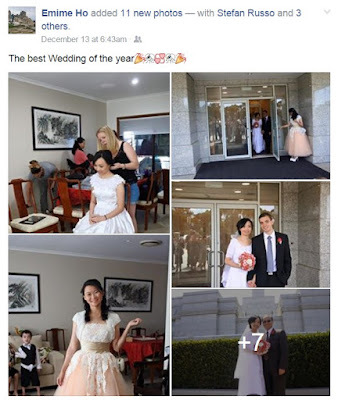 Clicking on the comments in the facebook post above will show more photos shared there. There were miles and miles of trails to follow, up and down the rolling hills as well as along the beautiful beaches that surround the island with pristine blue and green colors of the ocean with no commercial ships of any kind in sight! The MacLehose Trail is actually 100 km long. You can read about it here. No wonder we saw a row of tents along the beach for overnighters! We passed by some of them along the trail. Coming back to Malaysia now in my apartment office in the month of December about 5 days before Christmas, I took some time to follow our trail with Google Earth to find virtual views that match 7 pics I took with my camera. This was to enable the reader to 'virtually' walk the same path we did and see the same or close to the same views in those locations. Such Google "Virtual Tours" have been used in travelogues of other places I've visited such as Melbourne City. I was treated to a nice Thai food restaurant before the hike! Here is the loving couple leading the way. 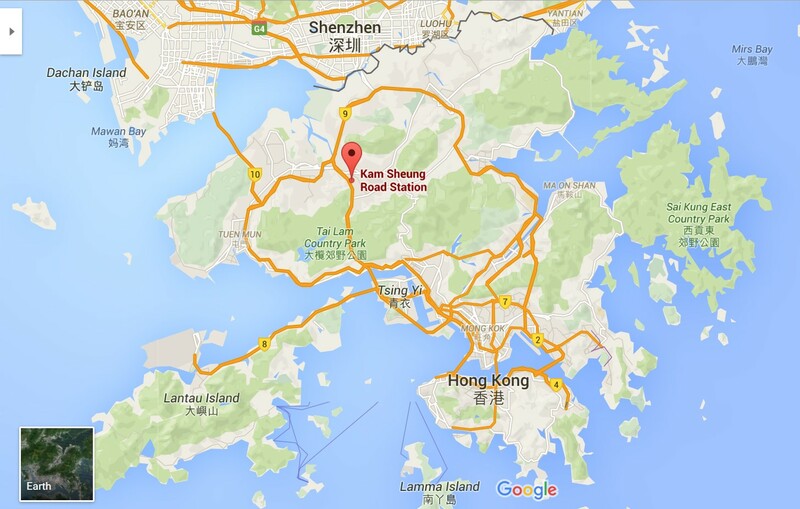 From the map, we could see that this trail at Tai Mo Shan is linked to the earlier trail at Sai Kung. The windy road up started getting misty as we walked higher up. Close to the peak, we could barely see the towers on top. The three of us succeeded our walk right to the top that took about an hour plus. Not too bad for an after lunch exercise in a cool environment. This visit to Hong Kong had a specific objective and that is to cross over to mainland China to Trace my Roots and finding my Ancestral Village which is largely shared in a spiritual blog post found here. Spiritual because of the source of inspiration that goes back to the early beginnings of my adult life which are also covered in the referred post. These relatives were the 5 children of my father's half-brother Tjong Tung Mau who lived in Hong Kong. 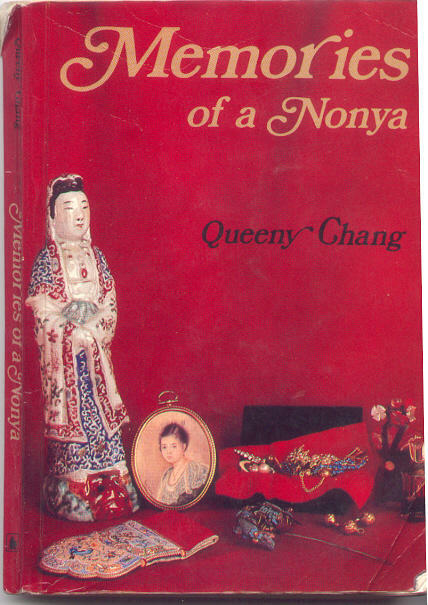 It was through my father's discovery of the book below, published by a distant relative named Queeny Chang, and my follow-up to find her that enabled us to know Tung Mau and his wife who visited us in Kuala Lumpur from Hong Kong on 20 April1984. A late afternoon view of the sun behind a large cloud was captured. What is more special that is caught is a bird flying in the sky seen on the top right of the cloud which can be seen clearer by clicking the photo to expand it. 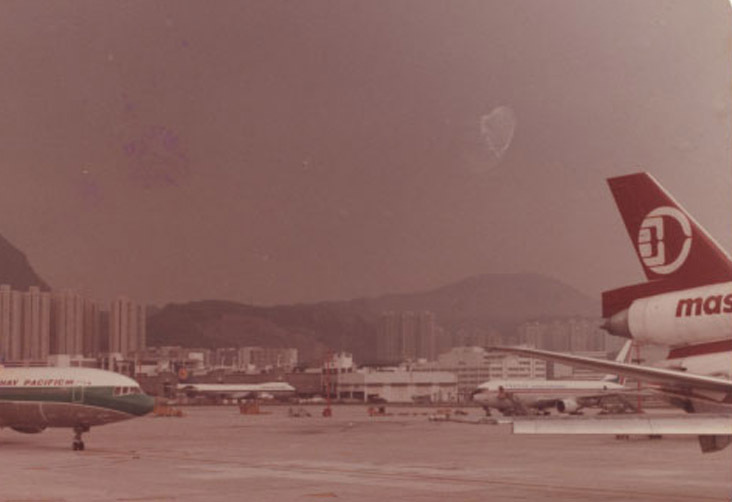 Quite a number of people are seen sitting on the deck chairs on the Kowloon side shielded from the glaring sun by the large cloud. How timely, a Chinese junk passing behind me on the habour with the Hong Kong island side of the view in the background. The Chinese junk reminded me of an old friend Eric Oh from KL who sailed his yacht to Singapore, parked it in a pier and was on a car rental to meet me on the day I was to leave for Hong Kong. It was nice of him to spend time with me for breakfast after which he was kind enough to give me a ride to Changi airport where on the way we could spend more time catching up! Busy ferries ply between Kowloon on this side and Hong Kong island on the other side. I didn't have a boat or yacht so I just caught a Star Ferry to get to Hong Kong island from Kowloon. This video was chosen when I created a special blog with the objective of exploring areas I've visited to have better knowledge and memory of those visits. It is also where I started using Google Earth views to provide a virtual simulation of being there to enjoy the view by being able turn to whichever direction desired. This is how I could then create what I've called the Google Pic URL for one to click to see a view that matches a pic taken by a camera from the same or close-by position, as in my hike to Sai Kung above. It is amazing how the latest technology can allow us to retrace our footsteps if we have already been to a place or to be more prepared before visiting a new place! My friend and I spent a morning shopping for tours to the mainland China that started from Shenzhen where the group was to gather to meet the guide and be led to the bus. According to my friend, these were very popular as they were very economical to include transportation, a guide, at least 5 meals a day and accommodation. 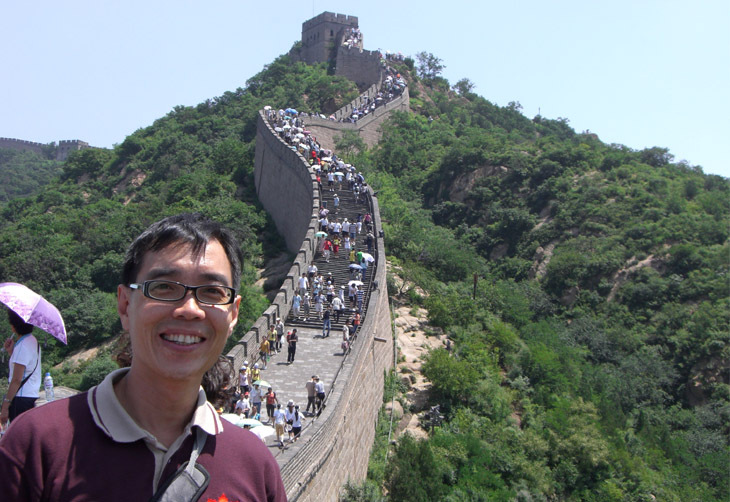 I had specified to make sure we get to Shentou and Chaozhou as I wanted to have a feel of this part of China where my ancestors would have passed to leave for new pastures in South East Asia, specifically Indonesia as per my family history researched information. My great grand father had also contributed large sums of money to build a railway that joined the two cities as shared here. Shantou City Old District from Colin Huang Ruobin on Vimeo. The bus arrived at our hotel located outside of Chaozhou. This is a view from our hotel room. My companion in yellow always ready to exercise in the morning! 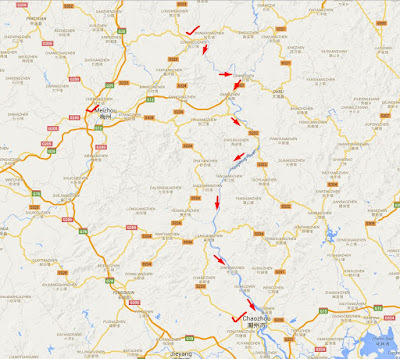 We checked out transport information whether to take a bus or train to Meizhou. 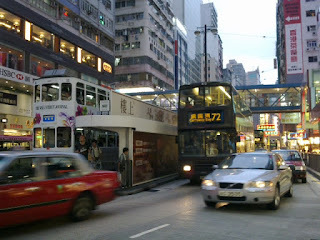 We decided on a bus to Meizhou which is our next and last destination on this crossing to the mainland from Hong Kong. Finding this abandoned railway station in the vicinity of Chaozhou made me relate it to the railway interest of my great-grandfather shared in the other post of this trip found here. The map shows Songkou town(highest tick mark) by the Meijiang tributary that flows into the Hanjiang river that passes through Chaozhou(lowest tick mark) to head to Shantou(out of map further south) for the open sea. Awake and I am back to Chaozhou again! Turning to my left and looking down stream I see another modern bridge with a pagoda building in the horizon known as Fenghuang Pagoda. There are two gates to allow people from outside to enter the old city through the ancient Ming wall that was restored during the 1990s. The above is the first. This is the other Eastern gate facing the Han river where the Guangzi Bridge (廣濟橋) is located as per the pic below. Guangzi Bridge (廣濟橋), built in the Southern Song Dynasty (1170 A.D.) was reconstructed in the 1990s. There are sections of the old bridge still remains. The new bridge is much higher than the original bridge. However, it still uses the same style as the ancient bridge. Here is me and my companion with the Guanzi Bridge in our background. Inside the wall is the old city with rows of shops and electric driven rickshaws seen above. 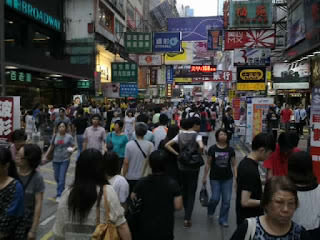 The city is small enough to be a walking city to visit the various interesting sites. I was tempted to ride on one of the electrical rickshaws on my own! Here is an interesting location that is about the Monkey God that my companion took time to read to me the writings on the wall that is supposedly a letter from the Monkey God. The well known Kaiyuan Temple is found in the old city. 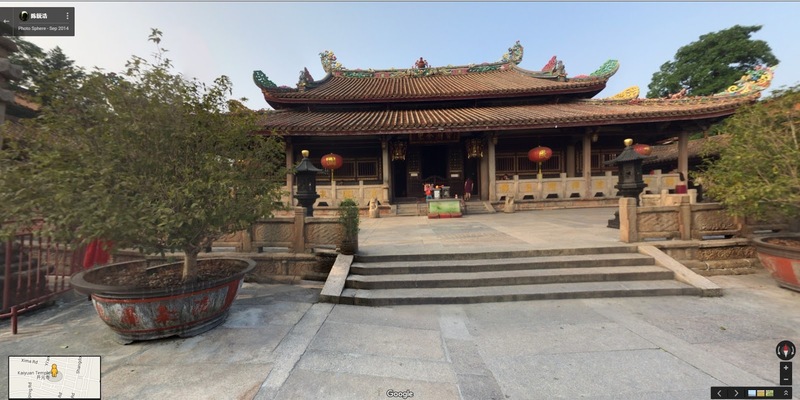 As China disallows google earth photography and mapping of locations, one cannot do a 'virtual tour' of a location as shown in locations of Hong Kong above. It will allow only a 360 degrees photo sphere capability from one single point to pivot from. Click here for the google Photo Sphere pic as above and rotate 180 degrees round to see the view of the building below in a distance. 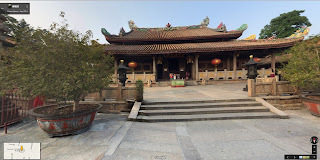 One cannot move closer like the Google Earth photos as photo sphere is limited to allow rotation or pivoting in one point only in a location to view its surroundings. Could you see the different building on the opposite side with a different symbol at the top of the roof? One has a pot at the top of the roof in the middle while the other has two dragons. Live shell fish, crabs or fish etc are sold in a few shops. My companion and I decided to go into one of the fancy modern shops to have shaved ice instead! 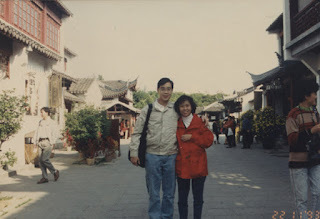 Here is a video from a third party source to get a feel of the old city in Chaozhou with the last part outside of the city that is not relevant. 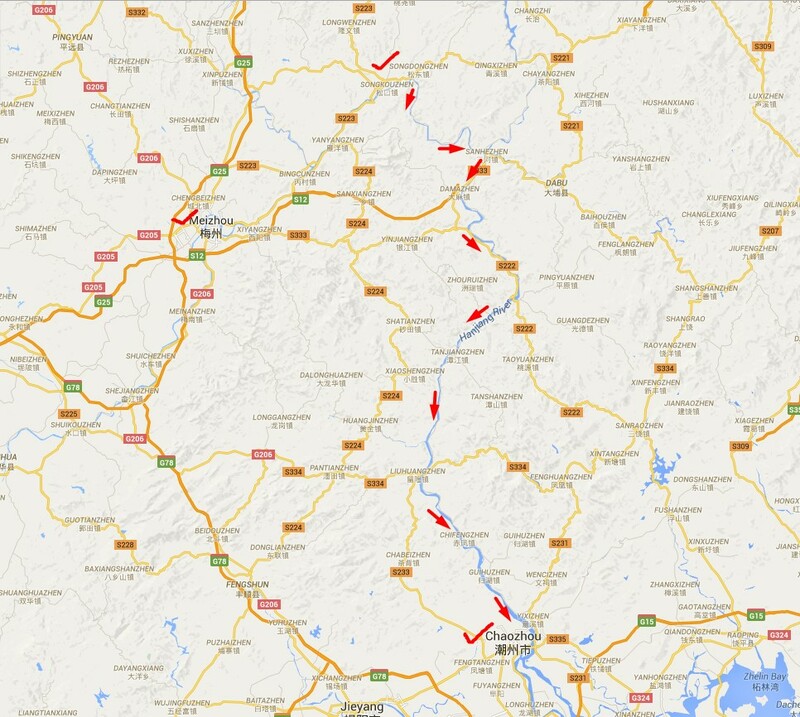 We see that the bus crossed the boundary into Meizhou city which consists of 2 Districts and 6 Counties as per the map below. 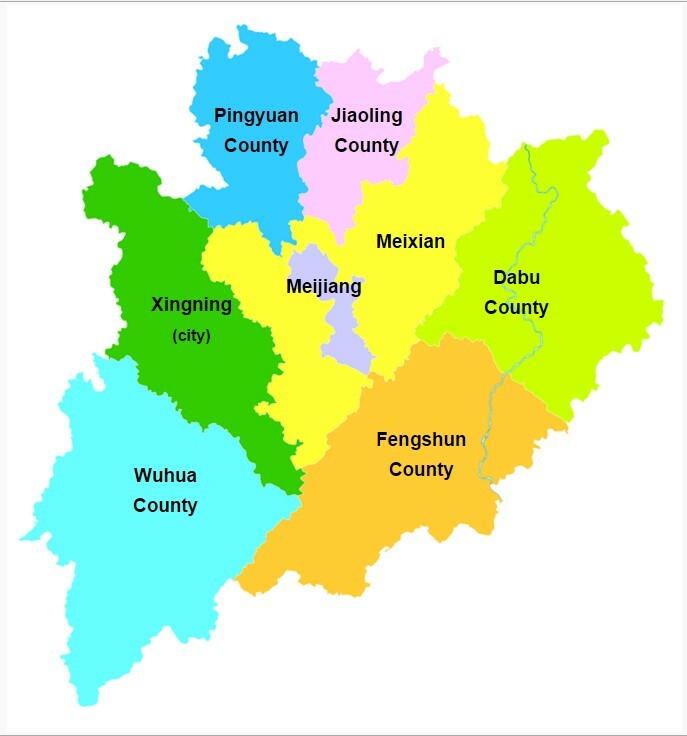 This map of Meizhou with its districts and counties with the size of land area, population etc are found here. 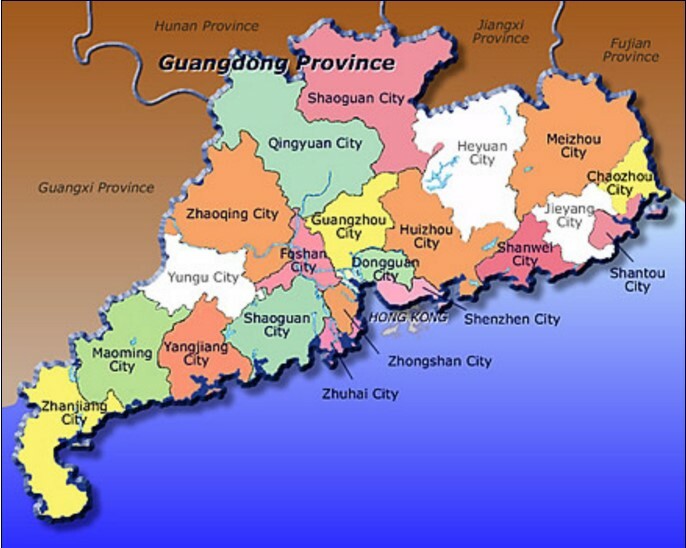 Meizhou is located in the northeast of Guangdong Province, bordering Fujian Province in the northeast and Jiangxi Province in the northwest. ...as we drove through several tunnels to arrive to our destination of Meixian district to find my Ancestral village or township of Songkou. It wasn't a dream that I found myself in Songkou in the photo shared earlier. 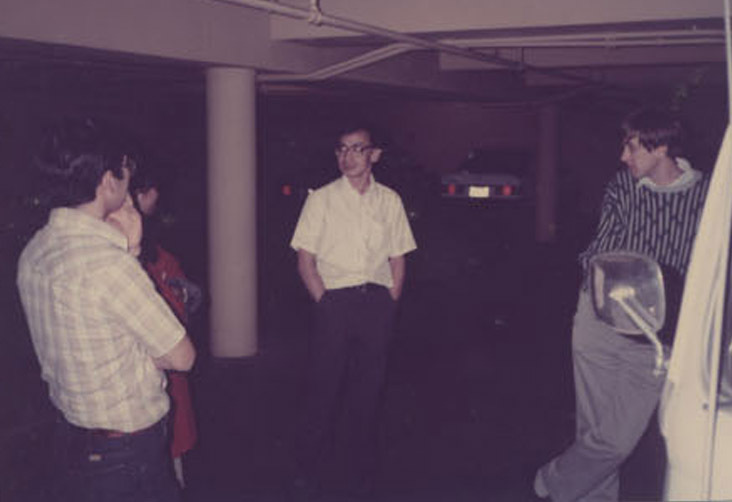 With my companion's help in Hong Kong who coordinated with Mr Tang in the photo below from Meizhou, he picked us up when we arrived in Meizhou and brought us to the hotel that he and booked for us in advanced. How we knew Mr. Tang who eventually arranged for another party to take us to Songkou is explained with more details in this other post. 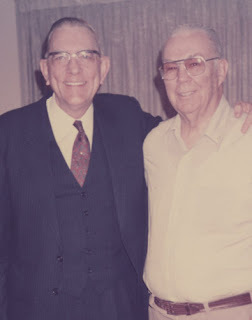 The entire story of finding my Roots or Ancestry is a true account, miraculous so it seemed almost like a dream come true. It is interesting to discover that Google did an auto photo page with maps too of my travel in China in search of my Roots which can be viewed here. After we were satisfied with the search of my ancestral village, we paid a visit to this memorial park to learn of a great Hakka leader Ye Jianying at a memorial park named after him with 4 large exhibition halls covering his life from beginning to end. I learned to enter each hall to start seeing exhibits from the wall by the entrance to follow along the wall of each hall to read the exhibits along the wall that tells the story of his life by chronological order. This will continue from the first hall on the ground floor to the other hall on the same floor and will continue to the halls upstairs. Firstly, I came across this photo poster with the caption below stating, "In 1916, Ye Jianying drifted faraway across the sea to Ipoh, British Malaysia, and looked for his uncles in the South East of Asia for shelter. The photograph shows the house Ye Jianying and his uncles used to live in (on the left of the street) in Ipoh. Then I learned that he started life with a military career following the Kuomintang (KMT), the Chinese Nationalist Party under the leadership of Sun Yat-sen and later Chiang Kai-shek. He joined Sun Yat-sen and the Kuomintang (KMT) after his graduation from the Yunnan Military Academy in 1919. He later taught at the Whampoa Military Academy where Zhou Enlai was an instructor in the political department. However in 1927, he left the KMT and joined the Communist Party. This have been due to a civil war in China fought between forces loyal to the Kuomintang (KMT)-led government of the Republic of China, and forces loyal to the Communist Party of China (CPC). What really caught my attention was to see the following photograph posters of the presence of Ye Jianying in significant meetings that paved the way for the groundbreaking 1972 summit between Nixon, Zhou, and Communist Party of China Chairman Mao Zedong, as well as the formalization of relations between the two countries, ending 23 years of diplomatic isolation and mutual hostility. On February 21, 1972, at the Capital Airport with Zhou Enlai, Li Xiannian and others, Ye Jianying welcomed the US President Nixon's visit to China. On February 25, 1972, Jianying accompanied the US President Richard Nixon to visit Zhenbao Hall of the Palace Museum. On October 20 1971, at the Capital Airport, Ye Jianying welcomed Henry Kissinger on his 2nd trip to China to prepare for the US President Nixon's visit to China in February of the following year. I was surprised that this man from my China home province was always present in all the major events of China's negotiation with the US leaders, yet his name was quite unknown to the world, or at least to me. Other leaders like Zhou Enlai and Deng Xiaoping, are far better known and as the above photos portray, whether it was the visit of President Nixon or his National Security Advisor and Secretary of State Henry Kissinger to China to start peace talks with the United States. Reading the wiki link given above of Ye Jianying, it is due to internal politics of the communist party where "His policies deemed too soft, Ye and his local cadres were soon replaced by Lin Biao's, and a much harsher policy was implemented, with Ye's political career effectively over. However, Mao did not forget what Ye had done for him during the Long March ((October 1934 – October 1935), and thus removed him only from political posts while preserving his military positions. As a result, until 1968, Ye remained active in various military functions, having been made a marshal in 1955. Ye was clever in using his military influence to provide limited support and protection for reformers like Zhao Ziyang, and he was responsible for interfering with assassination attempts on Deng Xiaoping during the Cultural Revolution. After Lin Biao was overthrown in 1971, Ye's influence grew, and in 1975 he was appointed Defense Minister, taking Lin Biao's post. 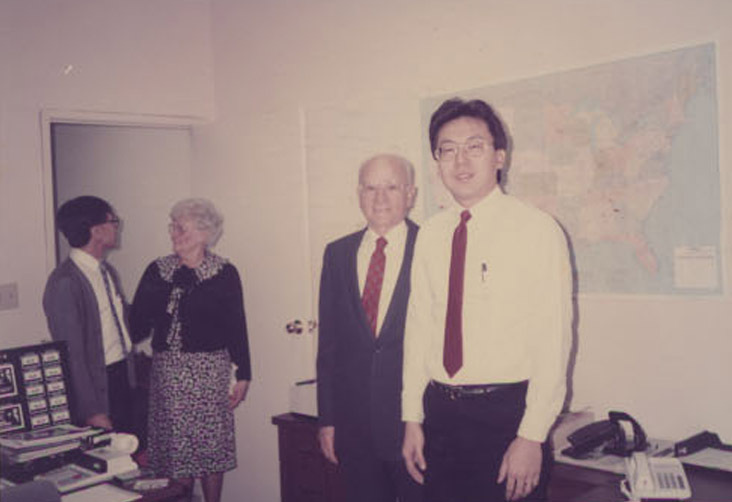 From 1973, he was also a Vice Chairman of the Central Committee of the Communist Party of China. He led the conspiracy of generals and Party elders that overthrew Jiang Qing and the Gang of Four; during initial planning at his residence, he and Li Xiannian communicated by writing, although they sat next to each other, because of the possibility of bugging. 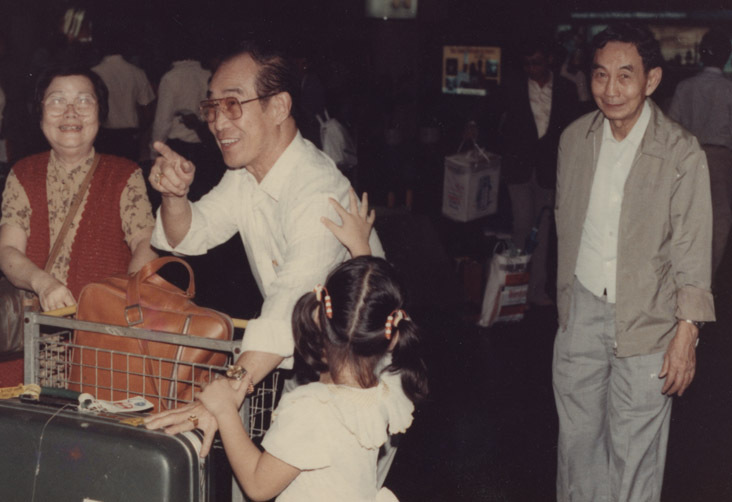 Thanks to Ye's support of Hua Guofeng, he was confirmed as vice-chairman at the Eleventh National Congress of the Communist Party of China in 1977. Because the physical demands of Defense Minister were too great for the octogenarian Ye, he resigned from that position in 1978 and was appointed Chairman of the Standing Committee of the National People's Congress, filling a post left unoccupied since Zhu De's death in 1976. As such, Ye was China's ceremonial Head of State. Ye retired from this position in 1983 and in 1985 he withdrew completely from the Politburo. He died a little over a year later at the age of 89." The above information of China is best continued in another blog post I created earlier that dwells more on the history of China or the Chinese people found here.